Nasser Al Attiyah and Mathieu Baumel are now watching their backs closely as Stephane Peterhansel lurks behind them ever closer. 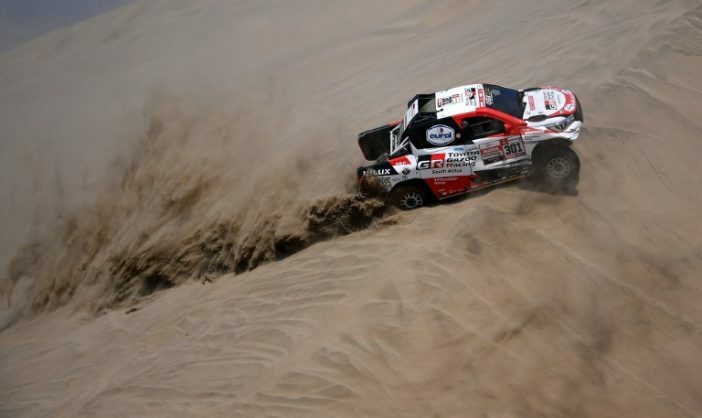 South Africa’s Toyota entry of Nasser Al Attiyah and Mathieu Baumel held on to the overall lead in the Dakar Rally in Peru on Monday despite coming fourth in Stage 7. The Dakar truly bared its teeth with a 323km-long test that saw MINI’s Stephane Peterhansel (France) close the gap to Al Attiyah and Baumel by 11:58sec. Despite the Frenchman’s victory on Stage 7, Al Attiya/Baumel still have a buffer of 29:16 over Peterhansel. Nani Roma (Spain), in another MINI, is in third, 37:59 behind the Toyota Hilux crews. Sebastien Loeb, who had been on a charge over the last three stages, lost significant time due to electric problems in his Peugeot on Monday, dropping down to fourth place in the standings as a result. This allowed the MINI brigade to catch up with the Toyota Hilux mid-way through the stage, and Al Attiyah planned to follow them through the dune section in order to help with his own navigation. “But then the wind came up and made it almost impossible to see in the fesh-fesh, so we lost more time towards the end of the stage,” concluded the Qatari star. Stage 7 was also a good one for Giniel de Villiers and German navigator Dirk von Zitzewitz. The 2009 winners posted the sixth-fastest time on the day, despite losing time due to the poor visibility in the soft dunes. They are now in the perfect position to support Al Attiyah/Baumel. “Our starting position for Tuesday puts us two cars behind Nasser – just six minutes in real time. So, if Nasser runs into any difficulties, which we really hope he doesn’t, we’ll be on site very quickly to support our teammate,” said De Villiers from the bivouac at San Juan de Marcona. Stage 8 will see a mixed start, with the top 10 motorcycles, top 10 cars and top 5 trucks all going off in order of the times they set during Stage 7.